Want to go back to school to become a nurse - Where do I start? One thing to consider is an accelerated BSN program. I had a prior degree and went back to school for nursing. I did my pre-reason at night school and then went to an accelerated program for my BSN. If opportunity costs are an issue, it's a great strategy. I am now an RN for 30 years and continue to feel I had a superb nursing education. How to deal with a bully patient? As a rehab nurse who got floated to unfamiliar units all the time in my clinical career, I can say this thinking accounts for a lot of my horrible experiences. I went to an accelerated nursing program and got my BSN in one (very hard) year. I was a career changer with a BS in another field and could not afford to be out of work for more than 1 year. This was 30 years ago....there are tons of accelerated programs out there now. If you already have a degree, consider this. I want interactions with patients but not bedside : Suggestions? I am a nurse case manager. My suggestion would be to mix in some field tasks with the telephonic case management. My company went in that direction and the mix really keeps you in touch with patients. Is the Baby Boomer Generation not going to get good care? I was also a career change RN; I left a career with a tight residency requirement that was going to make marriage very difficult. I dreamed of portability and a licensed skill set. I had no idea I was walking into a time clock punching blue collar world of forced double shifts, mandatory staff meetings at 1400 (when working 23-0700), unpaid early/late/work through lunch time. Don't get me started on floating to areas I had no experience or skills in. Or the phone ringing all day, every day on my day off. 30 years into nursing I found they I needed to look for jobs that met my needs for control of my time. I've done ok but those early years were treacherous. Are There Jobs for Inexperienced RNs Besides Floor Nursing? In my state there are no easy correctional nursing jobs. I was a PM nurse at a medium-max correctional facility. I was one RN for 700 inmates. I had to dispense from the pharmacy, do all the intakes, see to any emergency, do phlebotomy, exams and take off all the days orders. I also had to triage on site complaints from segregation to the units over a 200 acre campus on foot. As soon as the day shift left the imaginary crises poured in. Hardest I ever worked. Running the pharmacy was a fascinating experience, I learned a lot. However overall the gig was a daily stress volcano. I'm a Boomer. In my mothers time, she literally was not told she had cancer by agreement between the MD and my father. Having seen that first hand, there was no way I was going to allow a paternal approach to my care. We as a generation rose up and took control of health information, especially for women. So sure we're bossy and independent. Better than the alternative. What Do You Do When Co-Worker Falls Asleep on Night Shift? 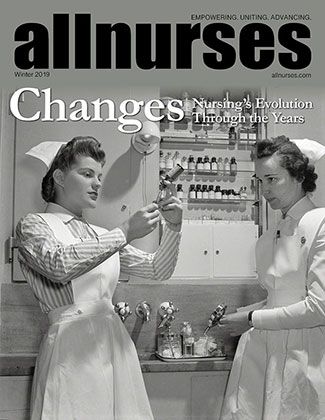 I was a straight 8 hour full time night nurse for most of my career. I guess my experience varied from others who posted as we always had a bare minimum of staffing. Either as a floor or charge nurse I has zero tolerance for sleeping. It meant someone else had to answer calls, check alarms, do the work. In my opinion you need to come to work rested and ready. Most of my career was also without a lunch break per agreement between nursing and mgt. I woke people (often asleep in a patient bed!) and explained the work was too much for the existing staff. I also reported repeaters in writing. I never worked anywhere that sleeping was acceptable. The only example I can think of was relating to catastrophic weather conditions where people who had worked doubles were put up in a dorm. The sleeping thing really bothers me because because it casts a bad eye on night shift workers and gives the impression that's all we do. When I worked pediatrics we got more admits on nights that the other 2 shifts combined. When is the Right Time to Leave First Job - Should I Stay or Should I Go? I'd say take the job if offered. You need to look out after you. My first job out of school was on a pediatrics floor starting January 1. We ended up having to move to another state December of that year for my husband's job. My last day was 12/20. I literally had people telling me "I owed them Christmas"; I was also told this would so harm my career no one would hire me. I had 5 job offers my first week. No one ever cared that I worked 11 months and 3 weeks at my first job. 30 years later, it's just a laugh to me. I'm a 30 year RN and I do case management. I'd love to work part time (I'm 62) and from home. However the job that I have is rigid on those points. They want 5 days a week in the office at specific times. I make great money and have world class benefits. I tried to push these points and got to the "we love you but if you are not happy here...." discussion. So I'm staying. You need to weigh out what the job does for you and how inconvenient the parts are that you don't like. Employers all have deal breakers and they vary job to job. I've never had a job that was 100% perfect. You need to assess what you can live with and what you need from a job. Best wishes! I am a salaried RN case manager and I make 100K a year. However I have 30 years of experience. I live in the Midwest in a modest cost region. Who paid for all this care? Just curious, not snark. I have another one. "No vacation approved from 11/15 to 1/15 every year". I was unable to go home for Christmas even one year during my 20 hospital years. Mandated floating and double shifts. No other profession would put up with this. These are also also the reason I transitioned to case management. I make more money, have professional respect and take a Christmas vacation every year. I loved patient care but got really tired of being treated like a serf. I trained a lot of this age new nurses. I found them to be willing to work hard but most had never had any kind of job before so boundaries of work were new to them. Mostly, I had to tell them they could not text all night or walk into patient rooms with their phone in their hand. I don't know why this wasn't covered in school but maybe their professors were my age and it never occurred to them this needed to be said. My accelerated BSN program was 25% people who wanted to be surgical/OR nurses. They all felt that the curriculum was 80% not relevant to their career goals. It's too bad there is not a more specialized way of getting credentials for that rather than so much training that isn't relevant.